Fraternity life at GW is almost unrecognizable from three years ago: Five chapters have been shut down, three more have opened and more are expected to come to campus in the coming months. Students in Greek life say that chapters’ sanctions and the climate of distrust between Greek life leaders and the administrators who oversee them cast a long shadow on campus. In interviews, three former fraternity leaders described their frustrations with GW’s assertive stance on regulating chapters in recent years. Officials said they work with chapters’ national organizations on most judicial cases, and investigations last as long as necessary to have a fair outcome for all sides. Fraternity leaders described drawn-out and opaque investigations into chapter misconduct and an overall patronizing tone toward Greek life from Center for Student Engagement officials. 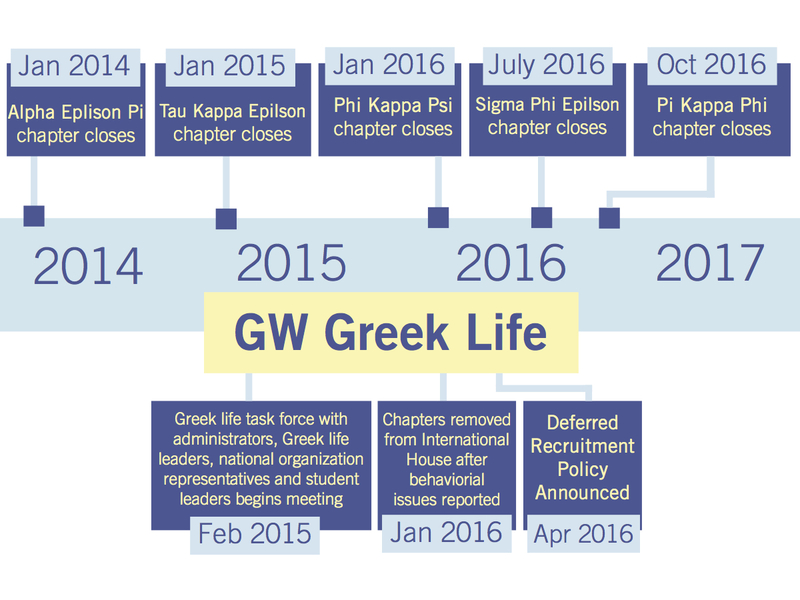 Officials have sanctioned more than 20 Greek chapters and national organizations shut down six campus groups in recent years, many of which had large memberships and long histories at GW. The University has kind of claimed a larger mandate on being able to control Greek life. The sanctions have rattled letter organizations, which represent about a quarter of undergraduate students. In fall 2015, the most recent year for which data was provided, 17 percent of freshmen and 23 percent of undergraduate men were members of a fraternity, compared to 29 and 27 percent, respectively, for Panhellenic chapters. GW hadn’t lost a Greek chapter in 10 years when Alpha Epsilon Pi’s national organization closed down the chapter in January 2014, facing 17 alcohol, drug and hazing violations from the University. The chapter was followed by Tau Kappa Epsilon in January 2015 and Phi Kappa Psi, Sigma Phi Epsilon and Pi Kappa Phi last year. The national organizations of each of those groups shut down the chapters, often citing hazing and alcohol violations. Delta Gamma, booted from campus in fall 2015, was the only Panhellenic chapter closed during this period. Raymond said the shuttered chapters had systemic cultural issues and usually deserved to be shut down. With each closure, the Greek Life staff reflects on lessons learned and updates the resources and support available to our organizations. He said often chapters are treated more favorably if group leaders go directly to officials after a misconduct report and don’t go through the investigation process. More than 20 Greek organizations, including chapters in the Interfraternity Council, Panhellenic Association and Multicultural Greek Council, have been sanctioned since GW began posting violations on the CSE website in 2014. The sanctions website has not been updated since last summer. Only one student organization that wasn’t a Greek group – the Black Student Union – was cited during that period. “That is when we know the system is flawed – when every Greek chapter is on some kind of probation,” Neil Hershman, a former president of Pi Kappa Alpha, said. During that time, Greek leaders complained that they were left in the dark about important decisions that involved the community. In 2015, officials created a Greek life task force, a group that eventually helped to decide last spring to implement a deferred recruitment policy for all social Greek chapters. That is when we know the system is flawed – when every Greek chapter is on some kind of probation. “It was very much sort of just happening over there, high up, at the administrative level without the community being there. And for recruitment, a lot of people view that as basically a solution looking for a problem,” Raymond said. Mike Massaroli, a former brother of Beta Theta Pi and former Residence Hall Association president, said he was blindsided by officials’ decision to kick Greek chapters out of International House in January 2016 after a series of behavioral issues. These kinds of events have led to a tense relationship between chapters and the officials that oversee Greek life, Hershman said. Harley Pease, the president of the IFC, said the current council has a good relationship with officials in the CSE and that he meets regularly with administrators. “Communication is pretty open, so as long as we have that, I think we can’t go wrong,” he said. Dominic Greene, the director of student activities at American University, said the relationship between chapters and administrators nationwide can “realistically be stronger.” He said that because leadership in chapters and councils changes over each year, administrators often have to continually educate Greek leaders about university policies. “Because the chapter leaders might not have a previous relationship with these administrators before they get in trouble, there’s a lot of kind of fear factor or trust issues that you don’t get us, you don’t understand us,” he said. Former Greek leaders said investigations are often months-long processes in which little information is released to chapters under investigation. Generally, chapter leadership and/or the chapter’s headquarters are updated as new information arises or upon request. Witkowicki said reviews are often collaborations between the Center for Student Engagement, the Office of Student Rights and Responsibilities and the chapters’ national organizations. There is no standard procedure for how an investigation is conducted – each varies based on the severity and type of charges and current and past misconduct issues for that specific chapter, she said. “Generally, chapter leadership and/or the chapter’s headquarters are updated as new information arises or upon request,” she said. Raymond said chapters often find that officials tell them little about how an investigation of their chapter is being conducted. Beta Theta Pi was most recently sanctioned for holding an unregistered event with alcohol and faced disciplinary and social probation followed by social restriction. “There is a very opaque, if not entirely hidden, process in which they investigate and present whatever evidence they think they have to chapters,” he said. Last October, just days before the Pi Kappa Alpha chapter was set to come off social probation – a sanction in which an organization cannot host any events with alcohol – from a previous violation, the chapter received a cease and desist letter from SRR alleging the office had evidence that the chapter had violated University policies that posed health and safety risks to new members, Hershman, who was president at the time, said. The chapter was ordered to immediately stop all operations in the letter, which was obtained by The Hatchet. Hershman said the charge was based on the fact that a freshman pledge was hospitalized the previous weekend after a night of heavy drinking at a nightclub, which the chapter was not involved in. No sanctions were issued as a result of the investigation, but the chapter was shut down for a month and Hershman did not receive any updates for three weeks, he said. “The position the University and headquarters staff have put presidents like myself in has ruined the past year of my life and my overall college experience,” he wrote in the email to Greek officials obtained by The Hatchet. The position the University and headquarters staff have put presidents like myself in has ruined the past year of my life and my overall college experience. In the past several months, IFC has moved to build back its membership by bringing new chapters to campus. Brandon Capece, who was IFC president last year, said last spring that the council was selecting chapters that appealed to students who otherwise might not join fraternity life. Three fraternity colonies are currently on campus, including Delta Lambda Phi – one of the only fraternities in the country aimed at gay, bisexual, transgender and progressive men. Six more chapters are set to launch colonies at GW through the spring 2022, including four chapters that were recently shut down. Raymond said he has noticed a notable and largely positive change in Greek life culture during his four years in Beta Theta Pi. He said there were chapters that weren’t “willing to go where the tide was going” but that the community is now mostly on board. “I think Greek life is on a path toward being more inclusive, more progressive, creating a community-wide expectation that certain behaviors like hazing and sexual assault are just totally unacceptable,” he said. This article appeared in the April 3, 2017 issue of the Hatchet.